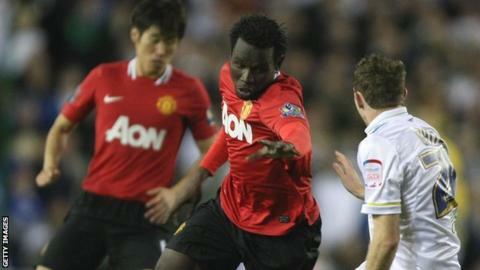 Manchester United forward Mame Biram Diouf has signed for German side Hannover 96 on a two-year deal. Diouf, who will train with his new side on Monday, played just eight times for United, and spent last season on loan at Blackburn Rovers. The 24-year-old joined United from Norwegian side Molde in 2009 for £3.5m but has reportedly been sold for £1.5m. Hannover coach Mirko Slomka said: "I am happy that with Mame Diouf we have another alternative up front." He added: "We need to bring him in fast so he can help us in the Bundesliga and the Europa League. "We have to focus on integrating him quickly." Diouf, who took over the number 32 shirt vacated by Carlos Tevez when he arrived at Old Trafford, made his five Premier League appearances for the club, all from the bench, in the 2009-10 season, scoring one goal. The Senegal international played 19 games for Blackburn last season, scoring six times. He also made three League Cup appearances for United this season after returning to Old Trafford in the summer. Read more on Hannoverscher Sportverein von 1896 e.V.